It is generally accepted by scholars that the ancient Romans and the Nabataeans were independently influenced by Alexandrian architectural style. Some of these similar influences can be observed in Roman wall paintings and Nabataean architecture. 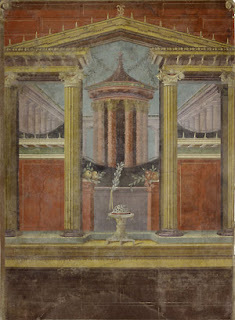 On the left is a Second Style painting from the Cubiculum M. of the Villa of Public Fannius Synistor, originally located in Boscoreale (near Pompeii) and on the right is an image of the facade of Al-Khazneh, a famous monument in Petra, Jordan. One of the Alexandrian influences on both examples is the broken pediment (architectural feature designed as an incomplete triangle). It is unlikely that Petra and Pompeii had any direct contact or artistic influence on each other. Instead, both ancient societies were independently influenced by the Alexandrian style. Isn’t that fascinating? Along these same lines, I recently found an interesting article that examines how Roman Third Style wall paintings include depictions of wind towers – triangular structures used on the roofs of Egyptian and Mesopotamian structures as a type of ventilation system.2 Neat-o. 1 For more information, see Judith McKenzie and Peter Roger Stuart Moorey, The Architecture of Alexandria and Egypt (New Haven, Connecticut: Yale University Press, 2007), 96-103. 2 Elfriede R. Knauer, “Wind Towers in Roman Wall Paintings?” Metropolitan Museum Journal 25 (1990): 5-20. That’s really interesting! It’s long been recognized that the theology of the Roman church was heavily influenced by the Alexandrian Church, and vice versa. I know that’s much later than the time period you’re talking about, but it’s interesting that the kinship lasted so long! Your blogs are so interesting. I feel so enlightened reading them.